So in the meantime, while I’m longing for the days of juicy tomatoes and sweet nectarines, I distract myself with some amazing varieties of citrus that are only available in the winter months…nature’s way of throwing us a bone, I guess. This month I was selected to participate in the Foodbuzz 24x24 dinner event (24 different meals taking place within 24 hours). For my dinner last night, I created an entire menu of citrus-themed dishes that will get you through even the coldest winter nights. Any good dinner party starts out with a cocktail, and this one sets the citrus tone with blood orange and Meyer lemon juices. It’s sweet and tart, very refreshing, and goes down almost a little too easily. Combine juices, rum and mint in a blender. Puree completely. Strain. Pour about 3 tablespoons of juice mixture into each glass. Top with champagne. Now that you’ve wet your whistle, here is a spicy first course of shrimp with red peppers, lime, garlic, cilantro and coconut milk. This dish has a good amount of spice but is nicely balanced by the tanginess of the lime and the creaminess of the coconut milk. 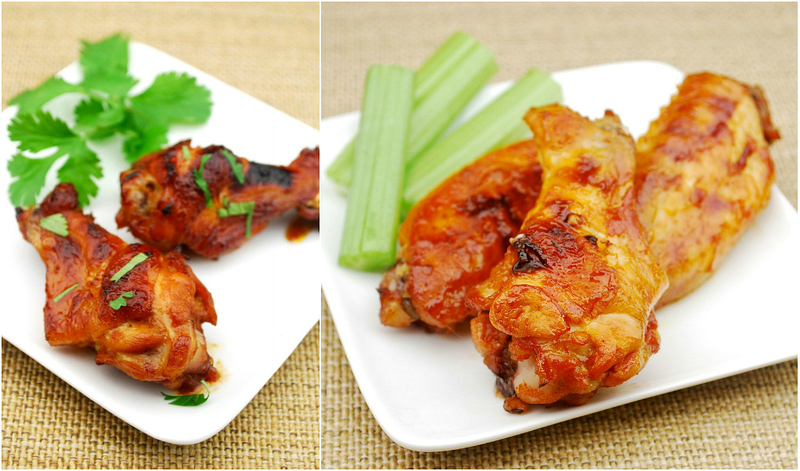 For marinade, combine first 7 ingredients. Add shrimp and marinate for 60 – 90 minutes. When ready to cook, heat a drizzle of canola oil in a large pan. Sauté garlic for 30 seconds. Add coconut milk, lime juice and sambal oelek. Whisk to combine. Bring to a simmer. Add shrimp and marinade, stir well and bring back to a simmer. Cook until shrimp are completely cooked through (time will vary depending on size). Remove shrimp from pan and reserve. Simmer sauce for a few more minutes until thickened, stirring occasionally. Divide shrimp and pour sauce over the top. Serve with bread to sop up sauce. 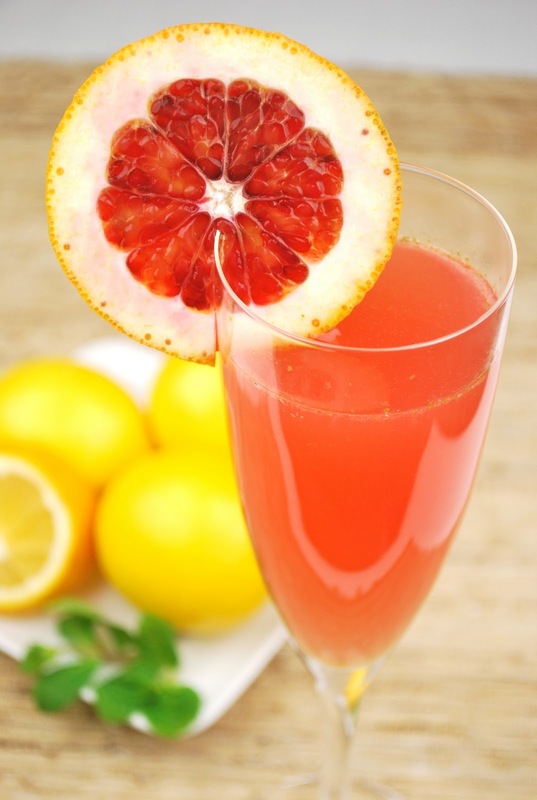 Citrus juice is a perfect component in marinades. It makes even a tough cut of meat cook up juicy and tender. The grapefruit and ginger in this marinade are a perfect match; so good that I boiled and reduced it down to be used as a sauce. Top with a fresh citrus salad with creamy avocado to turn this into a company-worthy dish. Combine first 6 marinade ingredients. Add meat. Marinate 24 hours. When ready to cook meat, heat barbecue to 400 degrees. Remove meat from marinade and pour marinade into a small saucepan. Boil over high heat for 10 minutes, stirring occasionally. (Strain out green onions if desired.) Reserve. Barbecue meat on direct heat for 15-20 minutes, depending on size and desired doneness. (For 2-1/4 pounds at medium-rare, we cooked ours for about 8 minutes per side.) Remove from barbecue and let rest under foil for at least 5 minutes. Slice thinly. Serve with citrus salad and sauce. If you like Creamsicles, this panna cotta is for you. The Cara Cara orange gives this creamy treat a delicate hint of citrus that is also a perfect complement to the tart raspberry sauce. And even after a big dinner, you’ll have room for this light dessert. There’s always room for dessert, isn’t there? 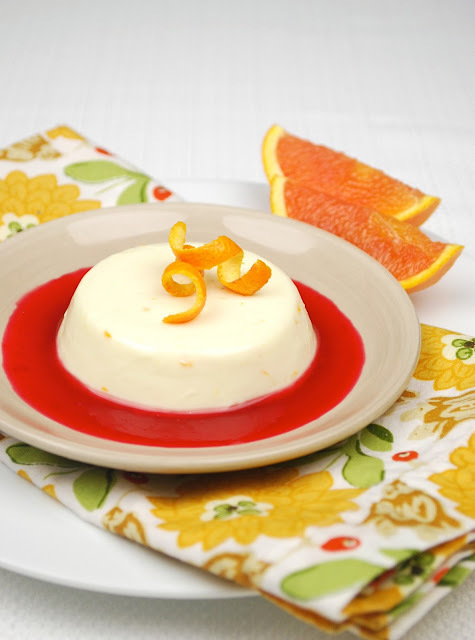 For panna cotta, whisk together yogurt, zest, orange juice and lemon juice in a large bowl. In a small bowl, pour water over gelatin. Let sit undisturbed. In a small saucepan, combine cream and sugar. Bring to a simmer. Remove from heat and whisk in gelatin mixture to dissolve, then whisk cream mixture into yogurt mixture. Pour into ramekins. Refrigerate until firm, at least 6 hours. For sauce, combine raspberries, orange juice, lemon juice and 1 tablespoon sugar in a small saucepan. Simmer for 5 minutes, then push through a sieve. Pour back into saucepan and add orange zest. Taste for sweetness and add up to 2 tablespoons more sugar as needed, returning to a simmer to dissolve sugar. Remove from heat and refrigerate until ready to serve. To unmold panna cotta, dip the ramekins in hot water. Slide a knife around the edge and tip out onto a plate. Serve with raspberry-orange sauce. *Cara Cara oranges are a type of navel orange, but sweeter and with pinkish red flesh. The potluck: a great idea…unless you’re a control freak. So, although I will probably not be having a potluck anytime soon, I was happy to contribute this spicy barbecued salmon dish to the gojee virtual potluck. Starting on Thursday, January 26, check out other potluck dishes fellow gojee contributors are sharing by going to gojee.com and entering “gojeepotluck” into the I Crave field. You can also follow #gojeepotluck on Twitter. Soak cedar planks in water for 2 hours. Whisk together pineapple juice, chili oil, soy sauce, brown sugar, jalapeno, and pineapple sage (if using). Marinate salmon in mixture for 1 hour. Remove salmon from marinade and pour marinade into a small saucepan. Boil rapidly for at least 5 minutes. Continue to boil and reduce if a thicker sauce is desired. Heat barbecue to about 450 degrees. Prior to placing salmon on planks, season (heat) planks on barbecue according to manufacturer directions. Cook salmon to desired doneness, 15-20 minutes, depending on size of fillets. (One 12-ounce fillet cooked for about 18 minutes.) Salmon should come off plank easily and skin may remain on the plank. Serve salmon with sauce spooned over the top. *Note: Do NOT substitute regular sage for pineapple sage. Using a cedar plank is one of my favorite ways to cook salmon. It’s low and slow, which leaves the fish tender and moist. The wood imparts a scent and flavor to the fish that you can’t get any other way and when combined with the sweetness and spiciness of this dish, it makes for a fantastic result. Here we are, nine days into the new year and I’m just now going to talk about things I want to do differently this year. Yes, I’m a little late to this party, but better late than never, right? I know myself better than to make resolutions. They just don’t stick, so why bother? Though for me, I am a big believer in starting fresh. For instance, if I decide on a Thursday that I want to start exercising, I’m very likely not going to put that into effect until Monday. There’s just something about a new week, new month, or new year that makes it easier to wipe the slate clean and become something else. So with this new year, there are definitely a few things I’d like to change. So far (nine whole days in), some changes have stuck while others seem to be having a slower start. Although I’m not surprised, I’m going to try harder to make those changes because I think they will ultimately result in a happier me. Even though I’m not calling these resolutions, I realize they do sound an awful lot like them. But my thinking is simply this: There are things that are begging to be done differently in my life. Some may help me live longer, some may help me feel better physically, some may help me feel better mentally. So I will try to do them until they become habit and I no longer have to remind myself to do them. Or I will fail. Really, I’m okay with either one, because if I fail, there’s always another Monday on the horizon. Change #1: Just be healthier. No rules for exercising five times a week or not eating sugar and red meat. Instead, remember that exercising for thirty minutes a day makes me feel better when I have that piece of cake or glass of wine. Remember moderation. I don’t have the best family history when it comes to matters of the heart and this change could make a big difference in my future. Change #2: Don’t be so lazy. I’ll admit it…my whole life I’ve gotten by doing the bare minimum. School came easy to me and as a result, I didn’t have to try very hard. I was always lucky when it came to jobs; they seemed to fall in my lap. As a result, I am a habitual procrastinator who can’t seem to get a job done until the eleventh hour. This needs to change. With this new job, I’ll be juggling a lot. The new job, a part-time job, my blog, and just regular life matters. Previously, I’ve had the luxury of working when I felt like it…I was my own boss. The reality of deadlines hit me this weekend as I cooked and wrote about six different dishes. Getting ahead will be key. Change #3: Keep my emotions in check. Another thing I’ll admit…I have a tendency to react quickly to all situations. I’m an emotional girl and that makes me who I am, but I do realize that it might serve me well to take a step back and assess the situation before I invest too much into it. Doing this could potentially save a lot of angst and stress. So there they are…my three non-resolutions that I’ll either keep or not keep. Maybe writing them down for all to see will help. Maybe it won’t. But with the goal being a happier and healthier me, there’s no harm in trying, right? In my attempt to finish other assignments this weekend, I realized that I didn’t have a dish ready for my blog. My first instinct was to say, “Screw it. I can post a blog whenever I feel like it, can’t I?” But then I remembered that I was trying not to be so lazy. Darn these non-resolutions! The good thing about this dip is that the active prep time is minutes. So you can still get that lazy feeling even though you’re actually getting something done. Win. Put all ingredients into a mini food processor and run until smooth. Serve with tortilla chips, pita chips, crackers or bread. *To make roasted garlic, heat oven to 350 degrees. Cut top third off of a head of garlic, exposing cloves. Center garlic on two sheets of aluminum foil and drizzle with olive oil, then sprinkle with salt and pepper. Pull up sides of foil and seal around top and sides. Place foil package on oven rack and cook for 50 minutes until garlic is soft. When cool, squeeze cloves out of skins. This dip will be my new go-to appetizer, especially since I almost always have these ingredients on hand. 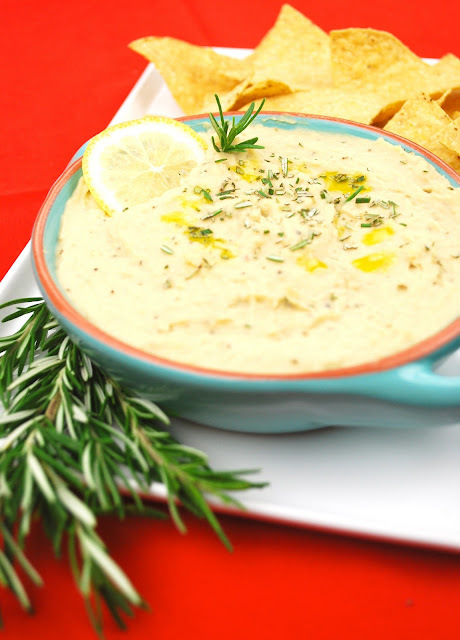 The flavors of roasted garlic, lemon and rosemary are toned down just enough by the beans and olive oil so that this dip doesn’t smack you in the face, but has enough zing to make you keep coming back for more. It’s addictive, but in a good way that doesn’t make you feel like you’re breaking any resolutions. We don’t need any help in that area, do we? Even now, come Christmas morning, I am beyond excited and I still wake up way too early. I pull on my most Christmasy socks, turn on the carols, and sip my coffee in front of the tree. Thankfully, Andy shares this excitement with me, making the holiday season even more special. It will always be a magical time of the year of me. Now, what does any of this have to do with living bravely? This year, Andy bestowed upon me what I think is my most favorite Christmas present of all time (a close second being that Cabbage Patch Kid I got when I was five). 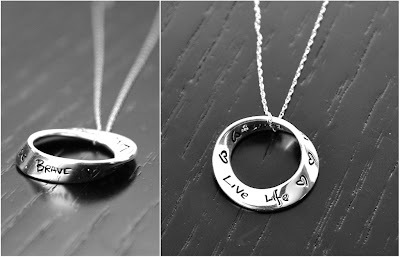 It is a simple silver pendant, in the shape of a circle, with the words “Be Brave, Live Life” stamped on it. It made my cry and I love it with every fiber of my being. See, Andy has long told me that I am brave, but I always brushed it off, chalking it up to a point of view jaded by love and affection. But he insisted. He insisted that it is brave to quit your very secure and well-paying job without really knowing what you’re going to do next; to make a huge change; to flounder around, trying to find your passion; to put yourself out there for anyone to judge; to risk rejection and heartbreak if it doesn’t all work out as expected or hoped. He insisted that I would find that thing that lit a fire under me and live out my dreams, however big or small they were. And I finally believe him. It has taken a bit of time, but now I think I’m brave, too. It would have been easier to stay in a comfortable job, collecting a paycheck every two weeks, and generally just mailing it in. But I didn’t. I took a chance, and with more support from Andy than I ever could have asked for, I am able to be brave and live life. I have a fire and a passion now, just like he assured me I would. It may have taken some doing, but eventually I got to where I wanted to be. Even in those times when it would have been easier to quit, I didn't. Seeing this sentiment hanging around my neck reminds me of all of that. Of being brave and living life. Hands down, best gift ever. If you have any sparkling wine leftover from New Year’s Eve (how could that happen? 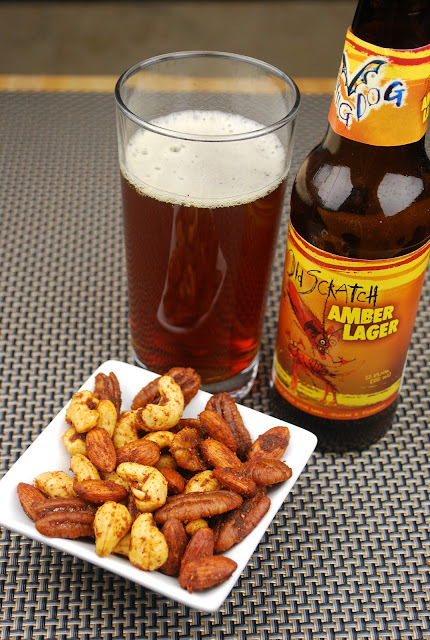 ), this is a good excuse to crack open a bottle. And since the recipe only uses a few ounces, you’ll have to figure out what to do with the rest. 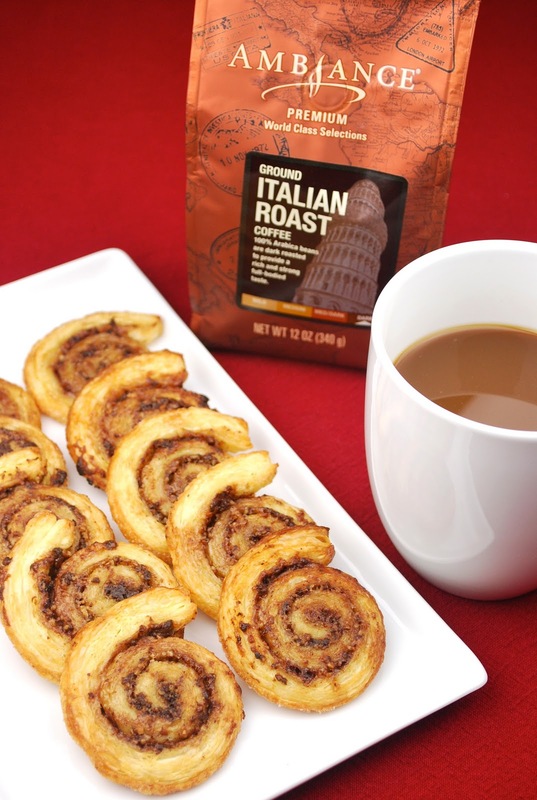 Whisk together all ingredients until smooth. If too thick, add a little more wine until desired consistency is reached. Combine flour, sugar, baking powder and salt in a large bowl. In another bowl, combine wine, eggs, butter and lemon zest. Stir the wet ingredients into the dry ingredients until just combined. 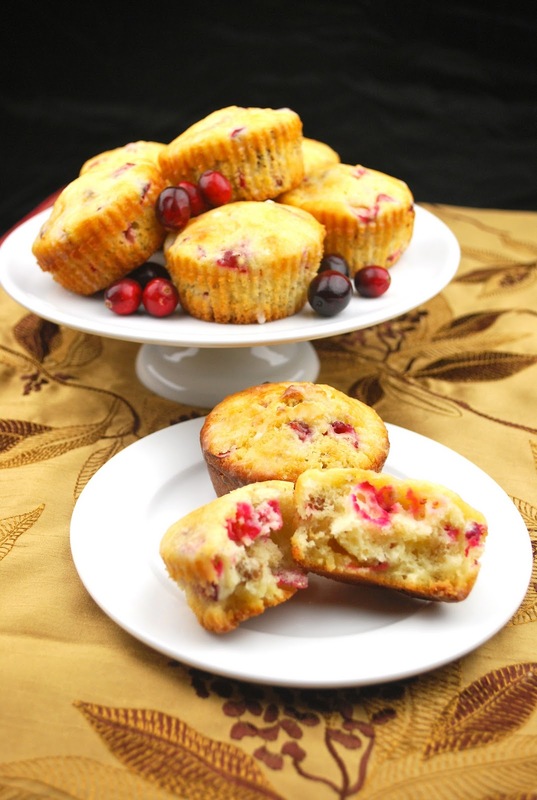 Fold in the walnuts, cranberries and white chocolate chips. 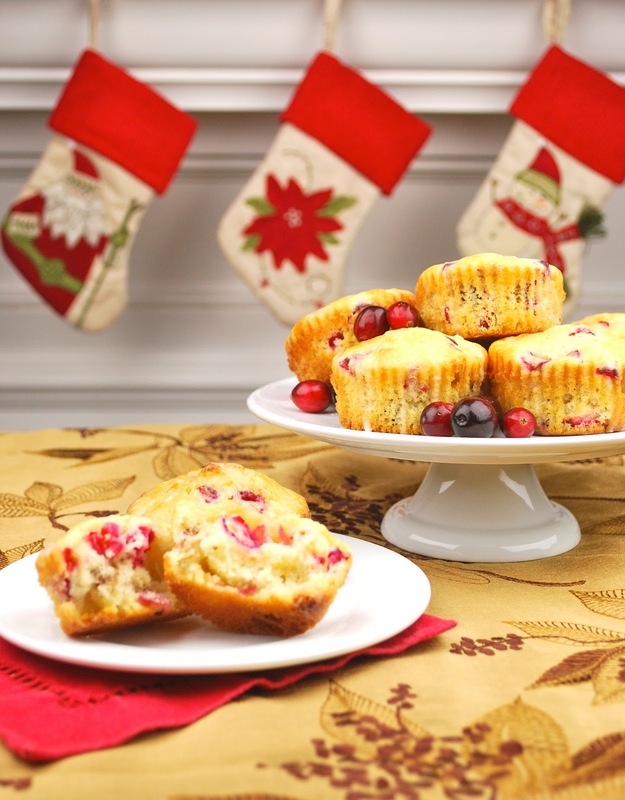 Prepare muffin tins* by lining with baking cups or coating tins with butter and then dusting with flour. 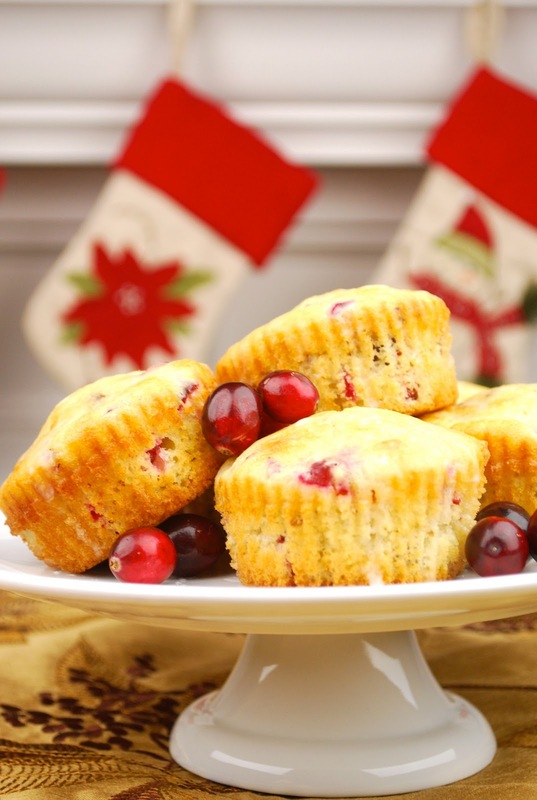 Pour batter (about 1/4 cup) into muffin tins. Bake for about 20 minutes, until set. Remove from tins and let cool on a wire rack. 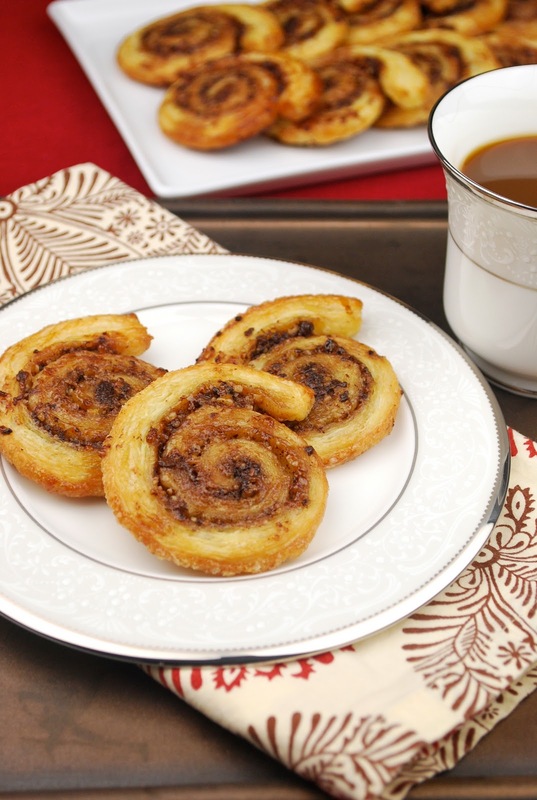 If glazing, wait until muffins are completely cool, then drizzle with glaze. *Note: The outsides of the muffins were crisper when using the butter and flour method for the tins. 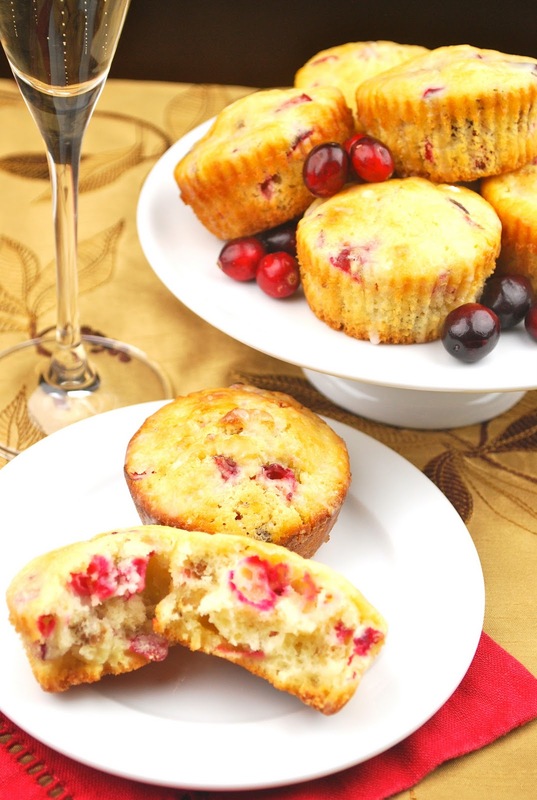 These muffins would be great for breakfast or dessert. 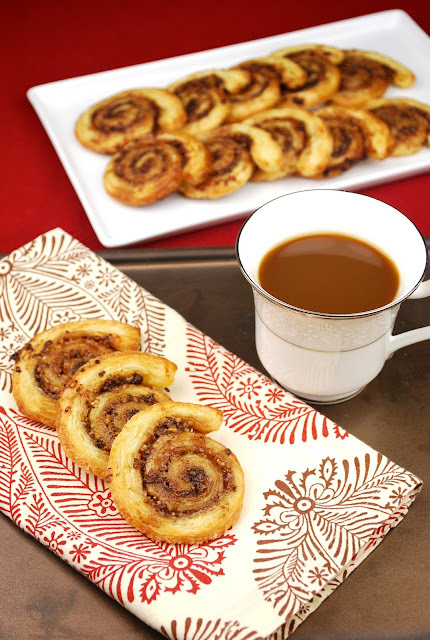 They have just enough sweetness to satisfy a sugar craving, but not so much that you feel bad eating one in the morning. Bites have a hint of tart, a bit of crunch and are light and moist. They didn’t last very long, which is always a good sign.